Recently Marielle and I along with our long time friend Matias went for a dive in the upstream section of Cenote “Chac Mool”. 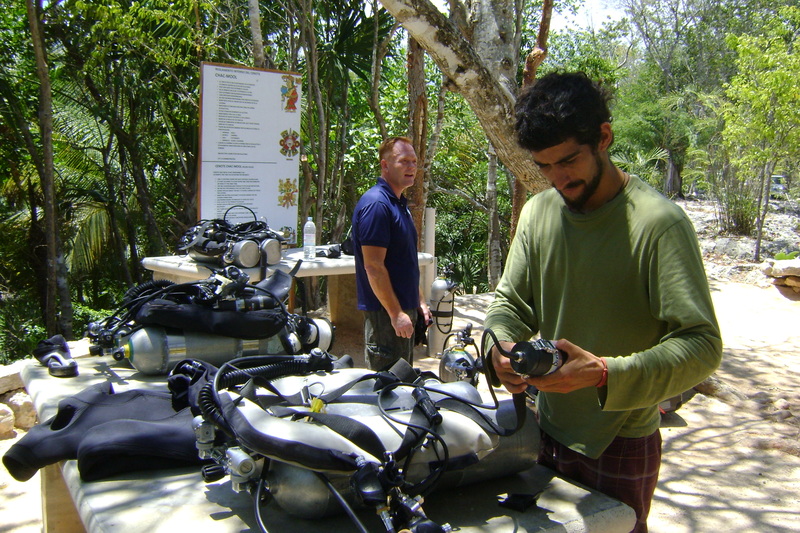 The day started out with picking up our twin-sets from the filling station throwing our equipment into the truck and driving a short distance from Playa Del Carmen to our destination. Once we arrived we walked down to look at the entrance and discussed our dive plan. We planned on doing a single stage dive as we wanted to increase the time we spent looking around this crystal clear cave. After setting up and inspecting our equipment we put on our wetsuits and headed for the water. Kris would lead and Marielle would follow in the rear, we planned for an hour penetration or half the required no deco limit as well as the usual 1/3 turn pressure. Having established our limits we entered the water and did our pre-dive checks as it’s been awhile since we’ve dove together. Once everyone was comfortable we started our descent into the crystal clear waters of the cave. Kris made the primary tie off in open water at the customary 5 meters for our last safety stop and proceeded toward the cave entrance. After a 6 minute swim and a few directional tie-offs we reached the mainline and tied in. After everyone inspected the tie in we proceeded down the mainline and watched as the natural light soon faded away into the complete darkness of the cave. Chac Mool is known for its stunning haloclines as the golden line runs at a perfect depth to swim in and out of this wonder of physics. Kris swam just off to the side of the main line while Matias swam on the other side of it so as to leave Marielle a clear access to the golden line as she was swimming in the back. While swimming in haloclines the mixing of salt water and fresh water is like swimming in oil as the differing densities of the waters collide and our fins help to increase the effect. We must be conscious of this as it can make it difficult for the last diver to maintain visual contact with the line. We started breathing from the stage and decided to switch to our back gas after 20 minutes or 1/3 consumption which ever came first. While swimming the 20 minute mark came and Kris signaled to the group to switch to back gas just as we were entering the first of the many large rooms we wanted to see. After confirming with everyone that the switch was successful we continued with our journey deeper into the blackness. While diving we came across some amazing structures as well as enjoyed seeing some of the cave life. The creatures that live in caves also known as troglodytes (cave dwellers) are completely blind and either albino white or completely transparent using an array of ultra developed senses to find their way around and avoid harm. We continued past jumps and more jumps to where the marker arrows turned to point a different direction, as we continued Kris made sure to mark the exit side of each permanent directional marker with a personalized NDM (non-directional marker) or cookie to assure our direction of exit in the event of a loss of visibility. After about 55 minutes into the dive Marielle signaled the turn as her computer read that she had about 55 no-deco time remaining and it would take that time to exit the cave from our current position. As we started the exit we increased our swim rate slightly as entry is the time to look around and exits are just that. One of the primary rules of cave diving is never enter at a speed that you can’t double your time out. This is a much overlooked guideline but an important one none the less in case an emergency situation arises you want to be able to exit as soon as possible. We only increased our swim rate slightly as we don’t want to tire ourselves or risk a cramp as there is still a long way to swim before we see daylight again. Kris calculated the time in which we would need to switch back to our stage cylinders at 90 minutes of dive time as we were currently at 55 minutes of total dive time and we switched 20 minutes into the dive. It’s an important calculation to know in the event of a valve shutdown but a relatively easy one. Either double your current dive time and subtract 20 minutes or add the 35 minutes since the switch, either way it comes to 90 minutes until we return to our stages. This gives a good reference of where you are in regards to the exit or in an emergency situation where you have extra gas, always a good thing to know. Upon reaching our connection with the mainline we all verified that we were in the correct place and proceeded to the primary exit where we took a 10 minute decompression/safety stop as we had a very long dive and wanted to allow our bodies to off gas that extra little bit before returning to the surface. After the dive we all took a few minutes on the surface to rest and talk about the dive before climbing out of the water. All in all it was a great dive and most importantly we followed the rules and came back safely.